This is not technically my recipe. My close friend served it at her daughter's birthday party and I begged her for the details. She finally gave me the recipe, and I couldn't wait to post it (with her permission of course!). Going to try something new with posting pictures. I thought this little set-up was cute. What do you think? Preheat oven to 350F. Grab a 9x13 baking dish and line it with wax paper. Use nonstick spray to coat the wax paper (this is important!). Mix together the butter, sugar, and brown sugar in a large bowl with a mixer. Add in the eggs and vanilla, and continue mixing until creamy. In a separate bowl, mix together flour, salt, and baking soda. Pour this mixture into the other and blend with mixer. Stir in the chocolate chips and spread the cookie dough on the bottom of your baking dish. In another bowl, mix together the brownie mix and all ingredients that it calls for on the box. Add in 1/2 cup hot fudge (melt it a little so it mixes easily). Set aside. Top the cookie mixture with Oreos. 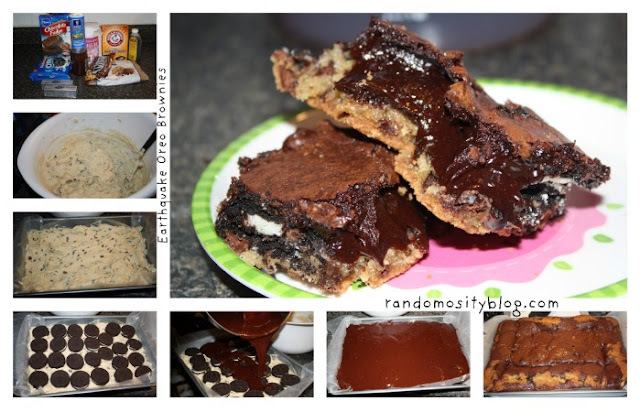 Pour the brownie batter over the Oreos. Bake at 350F for 55-60 minutes. I baked these last night, waited about 30 minutes for them to "cool", and then tried them. Honestly, I wasn't impressed. I started to wonder if I followed the recipe correctly, but I knew I had! So I waited until this morning and tried them again... WOW! World of difference! They are delicious (though very rich). When my friend served these, they were in very tiny portions - and for good reason. Let me know what you think of them! I saw this same recipe on Kevinandamanda.com about a week ago and swore to myself I need to lose 15 more lbs before I can make and eat this! Yummm!!! Oh my gosh, WANT WANT WANT to eat that!!!!!!!!! Yes, stick of butter is 1/2 cup. I will put that in my post, too! :) Thanks for stopping by!